Alamo Drafthouse Unveils PRINCESS BRIDE Signature Wine Line “The Bottle Of Wits” | Birth.Movies.Death. As you wish! The Princess Bride, the infinitely quotable, incomparably original, swashbuckling fairy tale is one of my favorite films of all time. Obviously! 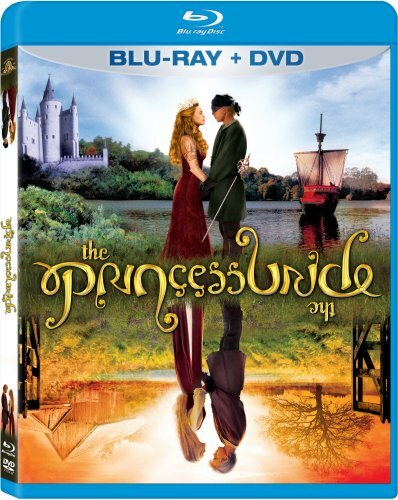 The Princess Bride gives us a dread pirate, insanity-inducing cliffs, fire swamps, a reluctant princess, a wily Sicilian, a six-fingered count, mawwiage, Rodents of Unusual Size, tiny Fred Savage, fencing, fighting, torture, revenge, giants, monsters, chases, escapes, miracles and--most importantly--true love! So I'm incredibly excited about this new Drafthouse venture for an incredibly deserving film. I especially cannot wait for The Princess Bride quote-along feast. I will BE THERE. Read on for the press release! Austin, TX--- Tuesday, January 31, 2012--- Alamo Drafthouse is delighted to announce the launch of a signature wine inspired by THE PRINCESS BRIDE in honor of the 25th anniversary of the film. The name of this signature wine program, “The Bottle Of Wits,” is derived from the iconic “battle of wits” scene when Westley first rescues Princess Buttercup from Vizzini and his henchmen. The “Bottle Of Wits” wine line will include two varietals: “Inconceivable Cab” and “As You Wish White”. The “Bottle Of Wits” will be available for purchase at all Alamo Drafthouse locations starting on Tuesday, February 14th and will be available for purchase online soon. “Inconceivable Cab” is a 2009 vintage California Cabernet, with a deep ruby hue. The nose is all black currant with subtle hints of oak. Medium bodied, full of plum and black cherry fruit, balanced by firm acidity and tannins. On the finish, lingering notes of cedar and vanilla dominate. It is complex & intriguing, with no trace of iocane powder. The “As You Wish White” is a light golden hue in the glass. This refreshing California blend has bright clean tropical fruit & green apple aromas. Medium bodied, with balanced acidity, it starts with bright tropical fruit flavors, leading to a long, citrus-laced finish. Perfect for relaxing after a daring escape through the fire swamp. When developing design of these wines Alamo Drafthouse turned to Austin local creative firm Helms Workshop to create the artwork. The design features a playful interpretation of the characters and quotes from the famous scene from which the wine names are drawn. In addition to the whimsical artwork that graces the label and packaging for Alamo’s new signature wines, Helms Workshop helped to design t-shirts and a set of die-cut embossed wine glass charms that are themed to THE PRINCESS BRIDE. “At the end of last year, we were thinking about ideas to do something really fun with our wine list at the Alamo Drafthouse Cinema. To solve that challenge, a group of us got together after work, opened a bottle (a timehonored Alamo tradition) and started to brainstorm our favorite movie scenes involving wine. Quickly The Princess Bride rose to the top. The “Battle of Wits” sequence between Cary Elwes and Wallace Shawn easily stands toe-to-toe with “the Sideways Spit Bucket” and “The Silence of the Lambs Chianti slurp” as wine’s shining moment in film,” said Alamo CEO and Founder Tim League. The “Bottle Of Wits” wine line will debut on Valentine’s Day at Alamo’s THE PRINCESS BRIDE Quote-Along Feasts (links to show pages below). The Quote-Along Feast features a five-course menu created by Executive Chef John Bullington with menu items themed to THE PRINCESS BRIDE. Each course is paired with wine, including “Inconceivable Cab” and “As You Wish White”. “Inconceivable Cab” and “As You Wish White” will be offered at all Alamo Drafthouse locations for purchase at a retail price of $7.00 a glass, $28.00 a bottle. THE PRINCESS BRIDE Valentine’s Day Quote-Along Feast – Austin, TX Locations. *Limited edition Mondo posters will be available for purchase at the Quote-Along Feast at South Lamar, Village and Ritz locations. THE PRINCESS BRIDE Valentine’s Day Quote-Along Feast – Houston, TX Locations. THE PRINCESS BRIDE Valentine’s Day Quote-Along Feast - San Antonio, TX Location. THE PRINCESS BRIDE Valentine’s Day Quote-Along Feast - Winchester, VA Location.